This book mainly covers the period 1900 to 1950 when Seahouses was a working town. The sea, fishing, fisher life and fisher folk as well as the harbour and the lifeboat therefore dominate the book but it also includes images of the town streets almost devoid of life, unlike today when Seahouses teems with tourists. 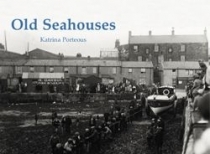 The text, by local author, historian and poet, Katrina Porteous, is rich and informative.